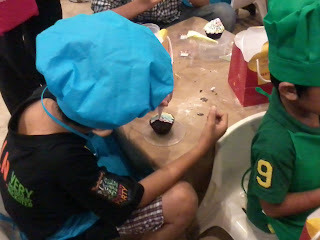 As parents, we all know how difficult it is to organize, manage and put together kiddie birthday parties. You’ve got to really plan ahead: scout for fun places, survey what are the foods kids will enjoy, brainstorm with fellow Moms and parents about ideas and totally squeeze out your creative juices to be able to come up with an awesome kiddie birthday bash. Thankfully, you can get some help from Max’s Restaurant. With numerous birthday party themes to choose from: princesses, super car racers among others, you’ve got to give in to your child’s personal choice since it’s going to be his or her special day—but you can make it extra special and truly an unforgettable one and Max’s Restaurant helps to show you how. Max’s Restaurant has acquired the license for Junior Master Chef—a successful reality cooking show that has gained popularity all over the world. 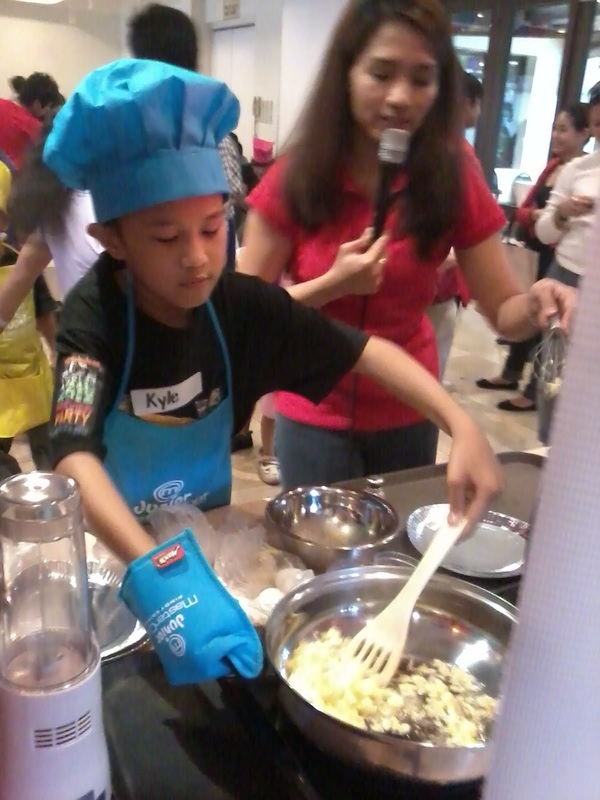 Junior Master Chef features kids who have the ability and passion for cooking. 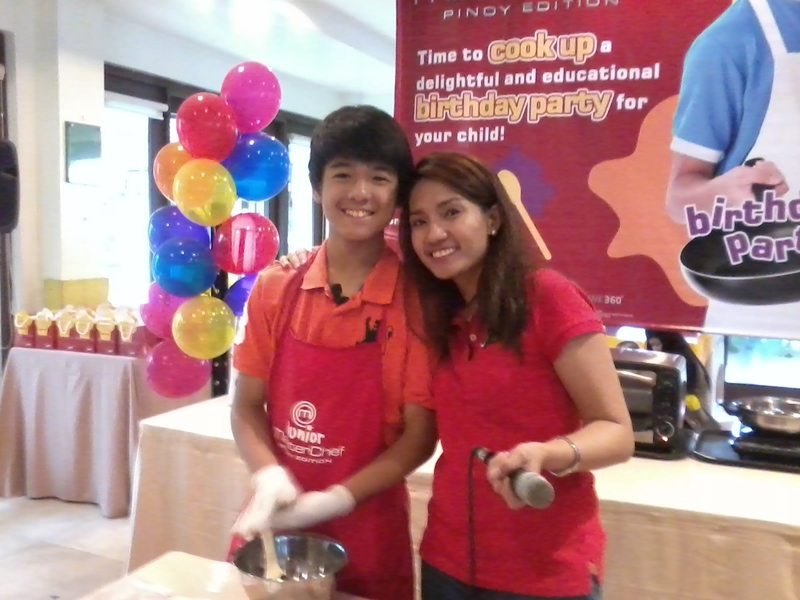 Junior Master Chef Pinoy Edition Finalist Jobim with a lady from Max's Restaurant. The cute and colorful toque hats and aprons with wooden spatula and spoon. 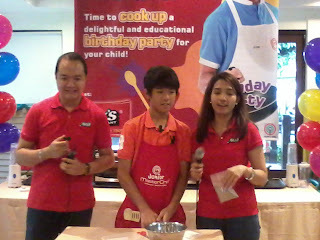 Mr. Bobby Simborio of Max's PR, Jobim and the lady host. Junior Master Chef Birthday Theme Package is one tasteful treat your kid will truly cherish forever. Let him put on an apron and toque hat as he whips up a dessert and learn the basics of cooking with his friends on his own birthday. Nothing’s more fun than that, right? “Kids learn best when they are having fun. 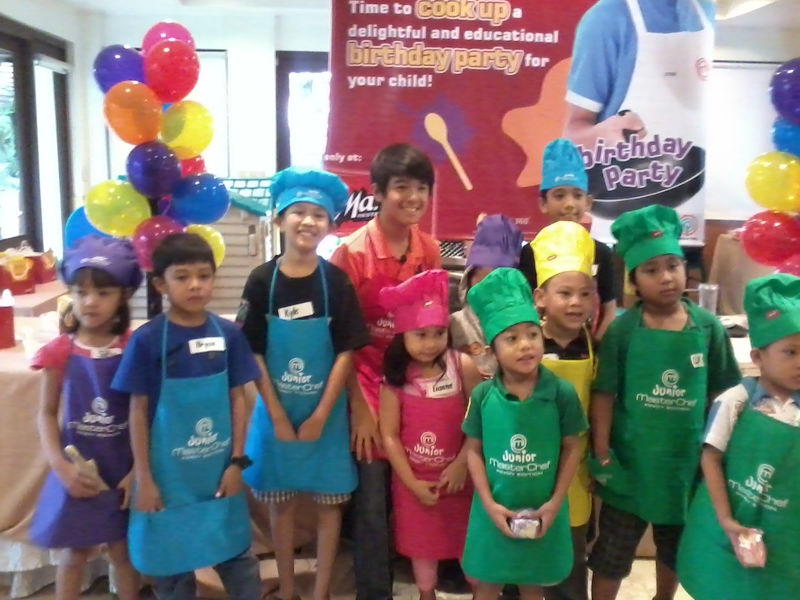 With Max’s Junior master Chef, we did not only infuse learning into a party concept, we also provided the key elements for fun and quality family time. Our vision is to create a one-of-a-kind experience that will forever be remembered by those who will celebrate at max’s,’ shared Bobby Simborio, Corporate Media and PR manager for Max’s Group of Companies. Kyle does his own chocolate crinkles. 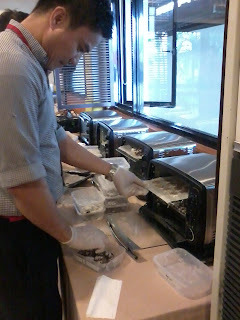 A Max's waiter does the oven bake for the crinkles. A mother assists her son with cupcake decorating. Filipinos can count on first-rate amenities and package inclusions, like tarpaulin banners, venue decors, party invites, balloons, cake, party hosts, kiddie tables and chairs, games, prizes, loot bags and of course, Max’s well-loved delicious food! 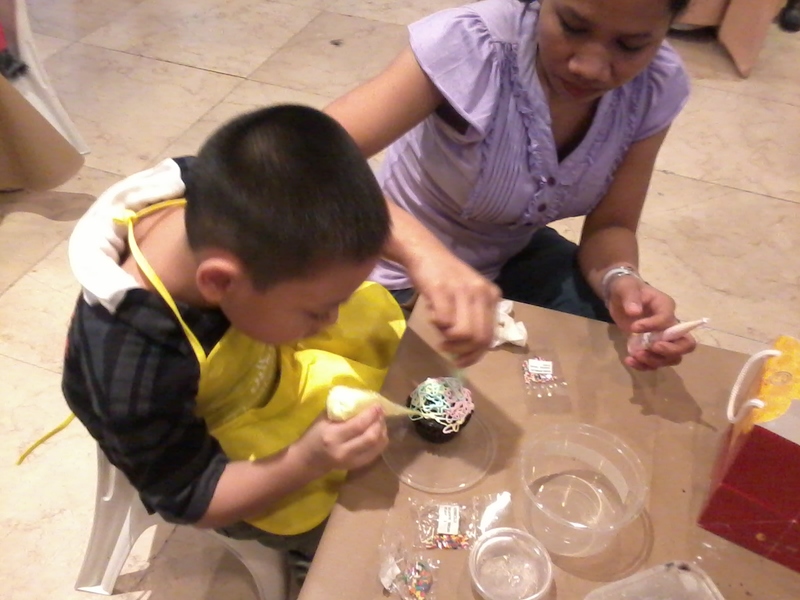 During the said launch, Kyle enjoyed the D-I-Y Crinkles he made as well as the JMC Cupcake Decorating kit with icing. 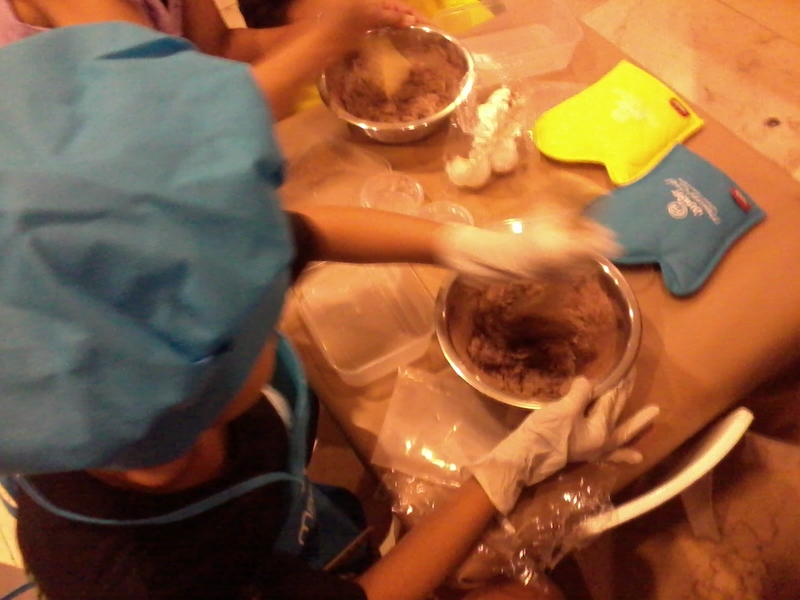 No worries Moms, Max’s had waiters who will be assisting your kids with baking the crinkles. They will be the ones to put the crinkles in the oven. To make sure they will return whose crinkle batch it is, they even put your child’s name on each container. Once done, they will return the freshly baked crinkles to your child. You may take them home or enjoy eating them. The kids looked really cute in their colorful aprons and toques, along with the JMC tools (potholders, wooden spoon and spatula + towelette), they looked like professional little chefs. Kyle does his cupcake icing very carefully. Kyle whips up a scrambled egg as the host looks on. If cooking isn’t something your child is interested at, don’t worry. 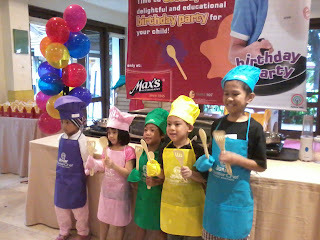 Max’s also had the Junior Art Masters Theme Party package. It includes an artist gear (smock and beret) and its own tools (bag, oil pastel, watercolor brush, towelette and picture frame). Indeed, Max’s Restaurant takes all the worries away from parents with all these amazing party theme packages everyone will surely love and remember. Aside from all these, as the kids enjoy in their activities, the adult guests will surely enjoy the hefty serving of Pancit Canton, Kare-kare, Crispy pata and the world-famous “sarap-to-the-bones” fried Chicken. 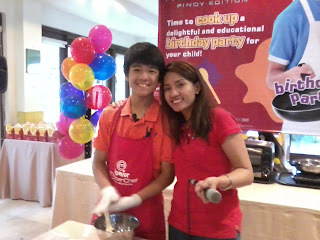 The Kids who participated in the Junior Master Chef Party Package had lots of fun and memories to keep. So, the next time you celebrate your child’s birthday, make sure to have it at Max’s Restaurant and experience the most unforgettable birthday celbration for your little master chef or an artist wannabe. Purple Plum Fairy thanks Ad Circles, Ms. Portia Terrado, Mr. Bobby Simborio and Max’s Restaurant for the invite during the said launch.